Create a path to citizenship for illegal immigrants while augmenting border security. Reform the legal immigration system to make it more responsive to the economy’s needs. Crack down on the hiring of future illegal immigrants. Improve the immigration process for admitting future workers while protecting current workers. Now, it’s not necessarily clear that immigration reform should do all of the things that the bipartisan proposal calls for, and before we can make any judgements we need to know how precisely they aim to address these issues. Where congress claims to be balancing democratic and republican concerns for the sake of assuring passage, we need to see if the compromises are worthwhile. The benefits must be certain to outweigh the negatives. So how specific does the outline get? Chuck money, employees, and technology at border security. Increase training and oversight of the border patrol to limit racial profiling and brutality. Creation of a system that keeps track of visas to ensure those carrying visas do in fact leave the country when their visas expire. Cooperation among border states on the issue of border security via a commission to oversee progress. Illegal immigrants are to register with the state, pay a fine of unspecified amount, and undergo a background check. Those who pass will be granted “probationary status”, those who fail will face deportation. Those on “probationary status” are denied federal benefits and, in order to get green cards, must go to the back of the legal immigration queue, complete another background check, pay taxes, learn English and civics, demonstrate work history and current employment, and do a number of other unspecified things. People who illegally immigrated as children or who work in agriculture will get special treatment (the latter group ostensibly for the purpose of guaranteeing food security–presumably farmers would have to pay American citizens minimum wages, and that would be too much for them). Reading this section, I am struck by just how strenuous the path to citizenship being laid out is. Quite a bit of work needs to be done, not merely for citizenship, but for the initial green card, for people who may have lived and worked in the United States without committing any crimes for years. It also seems odd that the law would require illegal immigrants to pay back taxes and a fine when at present they generally earn wages below the minimum, reduce costs for American businesses, and when the law is not prepared to offer them the benefits of paying taxes (namely, access to federal benefits). This is not merely to suggest that this is unfair to immigrants, but also to suggest that such a policy may set up a disincentive that causes many immigrants to opt to continue to remain undocumented. Award green cards to foreigners with masters or doctorates in the sciences. Introduce much stricter oversight of the hiring of illegal immigrants and fine and penalise employers who do hire them. Permit businesses who can demonstrate inability to find Americans to fill positions to fill those positions with immigrants. Strengthen workers protections–though it does not mention the extent to which this would be done. It should be noted that the total US population in 1900 was 76 million–it is nearly 4 times higher today. As a percentage of the population, the immigration figures during the late 19th and early 20th centuries were gargantuan, and they consisted mostly of, as the Statue of Liberty puts it, “the wretched refuse” of Europe’s “teeming shore”. The European immigrants of 100 years ago started at the very bottom. They had no graduate degrees in the sciences. They worked their way up from nothing and, over many years, became part of the wider American tapestry. 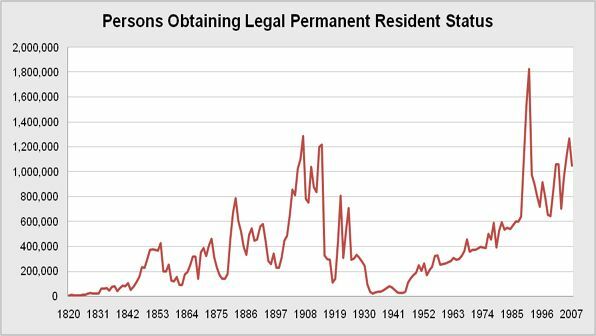 The 20th century is often called the American Century–if it was so, it was so because of the economic and population power of the nation’s immigrants. Why are we turning away so many people? Why are we making it so hard for people to contribute to our entitlement programmes and drive our economy forward into the next century? I see only one reason for this behaviour of which I can make any sense–xenophobia, the irrational fear that immigrants might “change our culture”, a bourgeois phrase that masks the true anxiety, the anxiety that the people around us might live or think differently than we do. We’ll be a lot more anxious some years from now when we are retired, cannot pay our bills, and find our economy trailing that of other nations because we chose to throw up the metaphorical border fence rather than let a few people into this country who are a bit different.